The reopening of the renovated Van Gogh Museum on 1 May, will be marked by an anniversary exhibition Van Gogh at work that shows how, within the short space of ten years, Van Gogh developed into a unique artist with an impressive oeuvre. This exhibition is based on the results of an ambitious research programme carried out by the Van Gogh Museum together with its ‘Partner in Science’, Shell Nederland, and the Cultural Heritage Agency of the Netherlands (RCE). Itwill mark the close of eight years of investigating Van Gogh’s working methods and illustrate the painter’s development with 200 works by the artist and his contemporaries.Microscopes and paint samples will help visitors to discover how h worked and mastered new skills. Unique combinations will be formed by Van Gogh and his contemporaries from the museum’s own collection, shown alongside exceptional art works on loan, together shedding light on Van Gogh’s fascinating career. And discover how the painter lived and worked. The exhibition will include some 200 works of art, including 150 paintings, works on paper, letters and personal effects of the painter, such as his original sketchbooks, paint tubes and only surviving palette, from the Musée d’Orsay in Paris. Visitors can trace Van Gogh’s development with the aid of numerous masterpieces from the museum’s own collection, in unforgettable combinations with unique loans. For example, the Sunflowers from the National Gallery in London will hang next to the Sunflowers from the Van Gogh Museum and The bedroom from the Art Institute of Chicago will be on display beside the museum’s own version. Another exceptional loan will be Portrait of Père Tanguy from the Musée Rodin in Paris. This painting was last exhibited in the Netherlands in 1930 and will probably, in view of its fragile condition, no longer be sent out on loan after this exhibition. A rich assortment of works by Van Gogh’s contemporaries will also be on show. Pieces from the museum collection will hang side by side with important loans, including pictures by Monet, Gauguin, Seurat and Bernard that Van Gogh himself once saw. 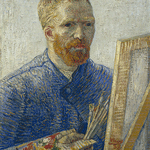 The Van Gogh Museum is constantly studying its collection to determine how best to preserve it for future generations. 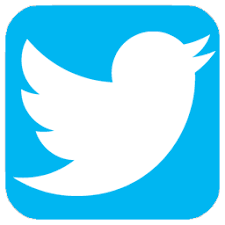 This entails knowledge and understanding of Van Gogh’s materials and working methods. Van Gogh At work will present some of the new insights gained through our long-term programme of research into Van Gogh’s studio practice. 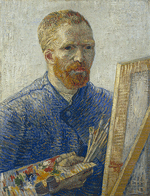 Since 2005, a multidisciplinary team of researchers from the Van Gogh Museum, the Cultural Heritage Agency of the Netherlands (RCE) and Partner in Science, Shell Nederland, has undertaken an intense study of the art-historical, material and technical aspects of Van Gogh’s work, also in relation to that of his contemporaries. Their findings placed old familiar works in a new light. The results represent a tremendous contribution to our knowledge about the artist and his work and are revealed in Van Gogh at work. Van Gogh at work describes how Van Gogh learned his craft, from his first experimental drawings to his famous later paintings. The largely chronological exhibition – filling the four levels of the renovated rietveld building will allow visitors to learn about the materials Van Gogh used and where they were bought, the conditions under which he worked and the artists who influenced him, for example. Like the researchers who took part in Van Gogh’s studio practice project, they can examine paint samples under a microscope and discover the grains of sand incorporated in the paint of pictures made-out of doors. They can also appreciate the bright colours revealed when conservators remove old discoloured varnish layers, search for the letters of the newspaper with which Van Gogh covered his damaged Bedroom painting, examine X-ray photographs and view a reconstructed 19th-century art supplies store.